Thank you for your interest National Glass & Metal Company. 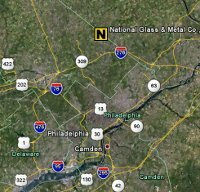 Unfortunately at this time National Glass & Metal does not have any open positions. Feel free to send us your resume to keep on file. Click map to get directions to our facility in Horsham Pennsylvania. For directions to specific project sites contact our office at 215.938.8880.